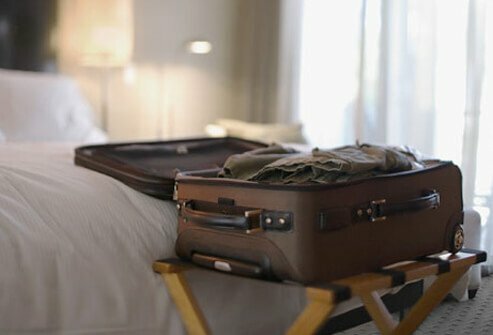 Reports of bedbugs can be found in the popular press and on hotel and travel review sites, and they appear to be making a comeback. The good news is that they typically do not pose serious health risks, even though their bites may be uncomfortable. These slides show you how to recognize bedbugs, know where they're hiding, and learn what to do to prevent getting bitten. Bedbugs are small wingless insects with a flat body. Like all insects, they have six legs. Their color can range from whitish to brown, but after feeding (on blood from animals or people), they appear rusty red. Bedbugs grow to about 0.5 cm in length and can be seen by the naked eye. Their name comes from the fact that they often hide in bedding or mattresses. Am I at Risk for Infestation? Found worldwide, bedbugs are most common in developing countries. 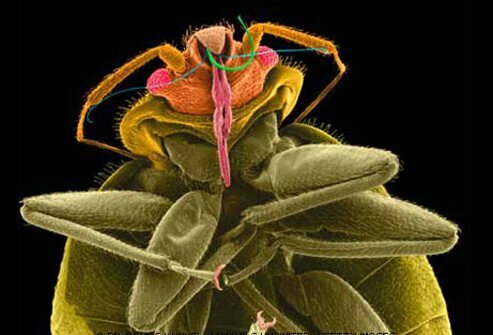 Still, reports of bedbugs in luxury hotels are not uncommon. They are most commonly found in areas like hostels, hotels, shelters, and apartment complexes where there are many visitors coming and going. When they enter your home, it's often because they have hidden in luggage, furniture, clothing, or boxes that are being moved. They can also travel on pets' fur. 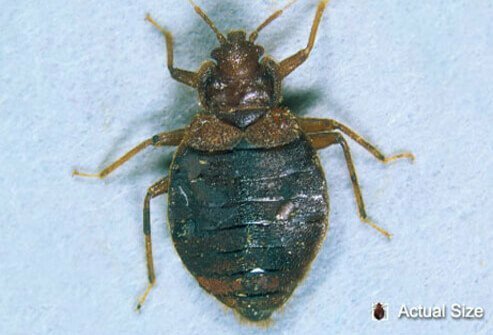 Increases in international travel may be responsible for the rise in bedbug sightings. Bedbug bites typically are stealthy and not felt by the host. This is because they inject a numbing substance into the skin along with an anticoagulant agent to prevent blood from clotting at the feeding site. Itchy, red bites on the skin may be the first sign you've been bitten. Bites are most common on the arms and shoulders, and the bites often occur in straight rows, as pictured here. The bites do not usually require medical treatment. Secondary bacterial infection of the skin may develop in areas that become irritated due to prolonged scratching. Topical antibiotic creams or ointments may relieve symptoms of a secondary infection. 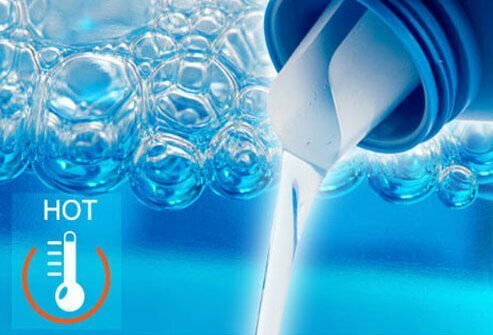 Antiseptic lotions may also be beneficial. 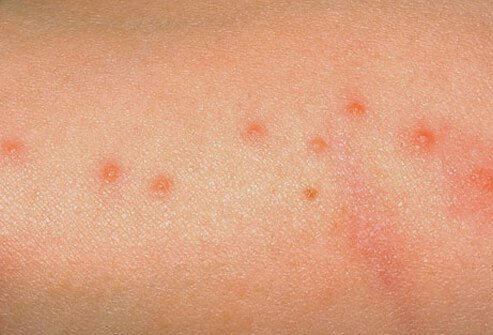 If you've had an allergic reaction to the bedbug bites, your doctor may recommend oral antihistamine medications or corticosteroids. Is It a Bedbug or Something Else? 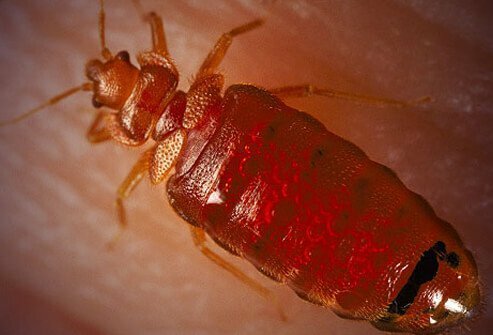 The bites of bedbugs can be difficult to identify, and not all red bites are due to bedbugs. Mosquitos, fleas, biting gnats, and mites can all bite humans. Collecting and identifying the bugs can help establish the diagnosis. They can often be found beneath or on the seams of mattresses. Their bloodstains may be visible even in the absence of bedbugs. You should also look into nooks and crannies of furniture, walls, and floors if you're suspicious that bedbugs may be present. Infested mattresses and box springs can be discarded or wrapped in plastic to trap the bedbugs. 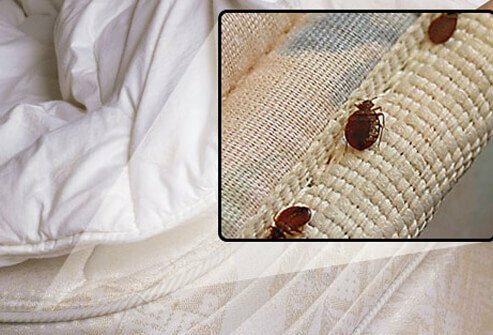 Washing bedding and clothes in hot water and drying with high heat can kill bedbugs and their larvae. Cleaning and vacuuming furniture and floors can also help get rid of bedbugs. Shake out suitcases after traveling. Only use an insecticide in cracks on floors or furniture in areas that do not come into contact with skin. An exterminator can help if you're unable to rid the home of bedbugs. © Pulse Picture Library/CMP Images / Phototake -- All rights reserved. 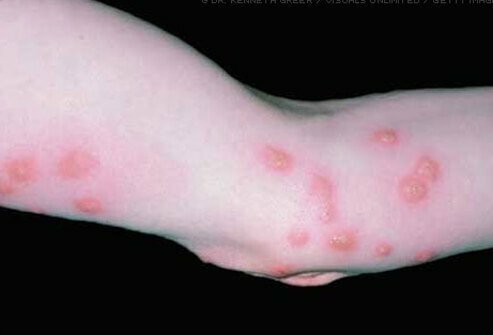 US Centers for Disease Control and Prevention: "Bed Bugs"